With sad faces knowing spring break was almost at its end, the GLCM group headed towards the final site visit, a high-rise office and mixed tenant space at 1201 Demonbreun St. constructed by Brasfield & Gorrie. Brasfield & Gorrie is an international general contractor located mainly in the southeast including Birmingham, Nashville, Orlando, and Dallas. B&G started up in 1967 and is quickly growing. 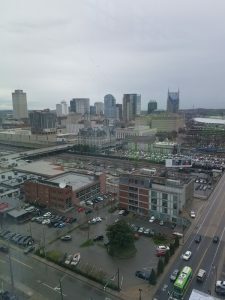 In Nashville, they specialize in commercial, industrial, and healthcare projects. Joining the GC are Hastings Architecture Associates as the architect and Eakin Partners as the Developer/Owner. 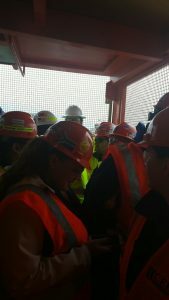 Brandon Johnson and Michael Love, both assistant project managers, lead the tour first to the 15th floor on a construction hoist. Brandon graduated from Auburn University and worked for a couple years in the estimating department before transferring into his current position. 1201 Demonbreun is his first on-site project in his young career. Michael, on the other hand, started working as an assistant project manager upon graduating from the University of Louisiana. The rest of the management includes a senior project manager, two superintendents, and three foremen for MEP, concrete, and general coordination. 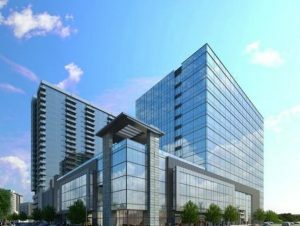 The total budget of the project is $97M and the construction price worth $53M, which includes 15 floors, a 940-space parking garage, and 285,000 SF of area. The contract is set up as a guaranteed maximum price (GMP) in which B&G is the construction manager at risk. The money savings above a certain amount are shared between the Eakin Partners and B&G. B&G is building the core and shell only; they do not hold an interior build out contract but it may also be pursued eventually. Amongst the current companies leasing in the building are Sony Music, Lendlease, Harwell Attorneys, Capstar Bank, and Friscos Steakhouse. A talent agency will also be leasing two floors, which includes a stage for concerts to be used by all of Nashville’s rising country stars. As an added feature, 1201 Demonbreun will not have any columns at its corners. This feature was put into design so that the beautiful Nashville skyline at the corners would not be obstructed. B&G is currently pushing towards tablet applications. They are using an application called PlanGrid that is used to document drawing revisions, RFI’s linked to sheets, progress pictures, and submittals. Furthermore, they are using a 3D coordination software for the MEP installation. The software detects clashes between the trades using a virtual model and has kept productivity at a good level. This technology combined with weekly sub meetings has kept the project on track and is currently slightly ahead of the October planned completion date. The biggest issue that B&G has run into on this project is the tight layout area. The job site is crammed into a tight corner of Demonbreun St. with barely enough room for a semi to enter. Due to the space restriction, B&G uses just-in-time deliveries on all materials. They order material for the site at or slightly higher than the lead-time so that they take little to no room on the job site. Upon arrival, B&G uses the material immediately to avoid site material congestion. Most materials used are recycled or regional, which is a large source of points they have earned for LEED silver certification. The biggest amenity of the building is the green roof deck. 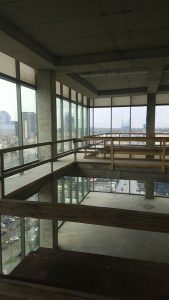 It will be rented out for parties and features a beautiful site of the Nashville Skyline towards the top of the building. It will have trees in steel planters, a canopy with LED lighting, and a stage with an AV system for live band performances. Also included is a 12 ft. fire pit that is sure to attract people during the warm summer nights. The tour concluded with a great conversation with Brandon and Kevin giving the GLCM group tips on the first year in industry. Kevin told us to make sure we absorb as much information as we can, take on any opportunity to learn even though it may not be our ideal job type, and find someone who is willing to answer questions. Brandon followed up by advising us to ask questions but to always aim to learn on our own as well.And with that, the GLCM spring break comes to a wrap. With three days left in our break, most of us are heading back home to see our families. GLCM wants to thank all of our hosts for a great spring break. We learned many things and definitely tasted the southern flavor of construction, as well as some great barbecue!